Gmail recently come with its new feature rich text signatures .Through using this feature you can insert pics,text colours,change font size and do many more in Gmail signatures. 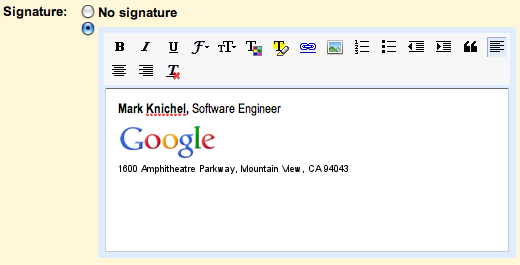 To insert an Gmail signature ,go to settings –> General –> Signatures. Now choose the signature option and type the text inside the box. You can insert small images (logo of your blog or website) or icons for your social media profiles. After inserting the image, hyperlink it by clicking the link tool. Click on “Save settings” button at the bottom of the page. You need to activate the “Inserting image” lab feature to insert image inside the signatures. One feature still missing is inserting image through your computer. You have to upload the photo to Picasa or Flickr profile first and then through its URL, you can insert images inside signature.